For great bird photographs visit the Bird Photography Weekly. Galahs are quite common around here and yesterday a group flew in to the vacant land next door and started feeding on the seed heads. When I approached with the camera the adult birds flew off but the juveniles obviously didn't see me as a threat so I was able to get some photos of them. The birding book describes juvenile plumage as being 'suffused with grey' in the pink areas of plumage. - and in the other direction the rain was falling. However, we only had to run back to the kayaks once to quickly find rain proof cases and covers for cameras and other gear. The birding was certainly worth it. There were the usual large numbers of Bar-tailed Godwits and Eastern Curlew, but we had come out especially to see what smaller birds were also there. We found quite a large flock of Great Knots. This was the first flock we had seen here this season but it is such a large site that it is certainly possible we had just missed them. There were also flocks of Greater Sand-Plovers, Lesser Sand-Plovers, Red-necked Stints and Red-capped Plovers. The birding books give all the fine details to distinguish Greater from Lesser Sand-Plovers, but the best way is to watch them side by side as we were able to do today. Counting a mixed flock like this is a special challenge. Today we were just looking. before they show signs of being disturbed. Season's Greetings to all who read this blog! 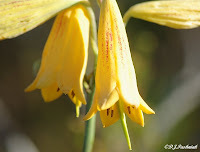 The photo on the top of this post is a Christmas Bell (Blandfordia grandifloria) which I thought was rather appropriate for right now. I photographed it yesterday afternoon on an afternoon trip into the Great Sandy National Park with Kelvin and Amelia and their family. We were going out to try to see and hear the Ground Parrots (Pezoporus wallicus). This is a very special bird and certainly not one you see very often. First you must know the right habitat – then I think you have to have a good amount of luck! Of course it helps to have good friends who know the area well and have often seen the parrots. There were a lot of tiny birds calling off in the very bushy heath. 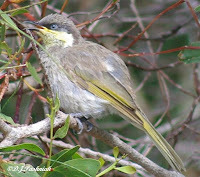 We caught glimpses of White-cheeked Honeyeaters, and Red-backed Wrens. It was impossible to go far off the tracks as the undergrowth was just too thick so I had to be content with distant photos for ID only. We stopped and boiled the billy on a little camp stove for a cuppa and sat around in camp chairs and just enjoyed the quiet sounds of the bush and the feeling of space and emptiness out there. To cap off a great afternoon I saw a Ground Parrot! Now I must admit that it was only a very brief glimpse before it dived back down into the scrub and I did not get a photo – but even a brief glimpse was great! Then we waited quietly as the darkness came, to hear the Parrots call. They only call for a very short time at dusk or dawn but it is a hauntingly beautiful call. The sound is not a bit like the usual harsh parrot call but is a series of clear ascending notes There were calls from six different directions so we assumed at least six birds in the area. I wish I could find a way to give a better impression of the magical quality of the light and the space as night came down. A big 'thank you' to Kelvin and Amelia and family for a great time! 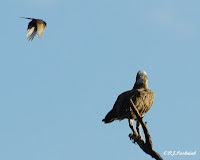 For great bird photographs go to Bird Photography weekly. 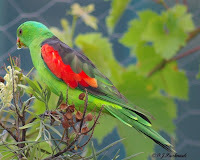 I was about to post about what a lucky day yesterday was - I finally saw and photographed a male Red-winged Parrot. However, it has turned into two lucky days in a row! 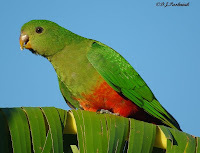 Some weeks ago I photographed a female Red-winged Parrot but there was no male with her. 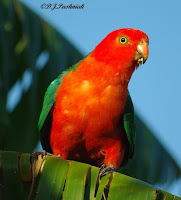 Last night I heard the sound of parrots in my grevillia bushes and when I went to look it was a whole family of Red-winged Parrots. I got good close looks at the male this time and was very pleased to get some good photos also. Male Red-winged Parrot - and like all parrots he is climbing in and around and over. Juvenile Red-winged Parrot - the sounds of a juvenile demanding food are unmistakable. Tonight I again heard parrots in the backyard and once again it sounded like juveniles demanding food from their parents. I could see green in the bushes but when I got close enough I realized that this time it was Australian King Parrots. They are green colored but with much more red on them. This time they were sitting up in my banana palms and moving in and out of the late afternoon shadows. There were a number of birds - I would guess again a family group but I only managed photos of the male and a juvenile. the juvenile is brown and in the female is yellow. The people over at Birdstack suggested that the world birding community might make some bird observations and share them. It was suggested that 12 hours on either side of the solstice would be OK for observations so I started at dawn this morning. I could hear the usual dawn chorus even before I opened the door - a Brown Honeyeater, Rainbow Lorikeets, Noisy Friarbirds, a Common Koel, and Peewees (Magpie Larks) Once again it was overcast with a threat of rain but also areas of broken cloud. I decided to risk the rain and take one of my favorite walks down at the bay. Driving down I saw Galahs, Sulphur-crested Cockatoos, Masked Lapwings, Crows, Kookaburras, Blue-faced Honeyeaters, Figbirds, and Crested Pigeons. The bay was as beautiful as it always is! The sun was shining directly across the water and the shoreline was in silhouette. The sky was still cloudy. 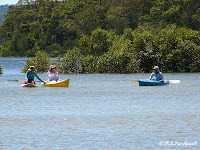 The tide was in so the walk was close up under the paperbark trees, the she-oak trees and the mangroves. Mangrove Honeyeaters were calling all around but mostly hidden. 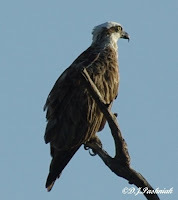 As I rounded the end of the bay I saw an Osprey sitting high on a dead branch of a tree. A couple of Willie Wagtails first scolded me and then spotting the Osprey decided to chase it off. Even an Opsrey doesn't like these little birds attacking and it soon flew off. A very nice start to the day - and I am sure rather different from the solstice in the northern hemisphere. Monday was a great day for the Noosa River survey. The morning count was interesting with a very high tide and most of the sandbanks underwater. Later in the day there were holiday makers everywhere! except, that is, for the one sandbank that has been completely closed during this summer period when the resident birds are breeding and there are large numbers of migrants around. It was pleasing to see the Beach Stone-curlew still on this island but no sign of any breeding from them. Now that really would be special! We were fortunate to see two Sanderlings - birds not commonly seen here. We saw them on both the high tide and low tide survey although on different sandbanks. This photo shows one of the Sanderling with a Red-capped Plover immediately behind it and a Red-necked Stint on the left of the photo. In the evening we did a count of terns coming in to the sandbanks for the night. Most were juvenile Crested Terns - the adults are breeding on off-shore islands right now. There were very few migratory terns - another puzzle to which we have no answer at present. I am only learning about tern migration and behavior, so am very grateful to be with experienced birders from whom I can learn. This photo was taken from the south bank of the river where we sit and count the terns in the evening. On Sunday I kayaked around to the Mullens Creek shorebird roost with Kelvin and Amelia and did a count of the birds. It was a very high tide and we found an increase in bird numbers from the lower tides that we have been counting recently. This is a much larger roost site and there are always more birds here than on the Crab Creek Site. We counted about 2,300 birds (I don't have final count numbers yet). Most were Bar-tailed Godwit and Eastern Curlew. The Eastern Curlew flew right after we had counted them but then re-settled on the other side of the bay and we checked our numbers there again. There are always interesting birds in the car park where we launched the kayaks. This Mangrove Honeyeater was sitting in a tree with its feathers fluffed up, but let me get a photo showing its blue eye. I do a monthly count of shorebirds at one of the roosting sites around the bay for the Queensland Wader Study Group. However, the count numbers over the last few months have not been as I would have expected them from counts over the last few years. I have been wondering if it was because the counts have not been scheduled on the very highest tides. This bay is very shallow and although shorebirds do like to roost at regular roost sites there are always a few that stay where they are if they are comfortable and not disturbed there. My counts thus far this season have been less than 400 birds. In previous years I have counted around 1000 birds. To test my idea about the tide height I kayaked over to the site this morning on a very high tide and did a complete count. This morning I counted between 800 to 900 birds. The largest portion of the flock was over 500 Bar-tailed Godwits. There were also good numbers of Eastern Curlews, Whimbrels, and smaller numbers of Common Greenshanks, Pacific Golden Plovers, Grey-tailed Tattlers, and Red-capped Plovers. This is great as it appears that so far, at least in this area, we are not experiencing the drop in shorebird numbers that has been predicted. Here are a couple of photos of the main flock and also a portion of that flock. Clicking on the images below will bring up very much larger images as I wanted to give a good idea of the size of these huge flocks of shorebirds. This morning I took advantage of an early tide and good weather to kayak around to a shorebird roost that I haven't visited for a few weeks. This roost is quite close to the channel leading out from the Mullens picnic area. However, immediately in front of the roost the water is very shallow – great for a kayak but I don't think even a small fishing 'tinny' and outboard would get in here. There is a small stretch of sandy beach and sometimes there are birds roosting there. However, the mangroves fringing the shoreline always have roosting birds. It is the only place that I have found Terek Sandpipers around the bay. There is usually a mixed flock of Terek Sandpipers and Grey-tailed Tattlers, but the Tattlers are also found in lots of other places around the bay. This morning my estimate was at least 150 birds roosting in the mangroves, but I was not fast enough to see how many Grey-tailed Tattlers and how many Terek Sandpipers. Both these species prefer a mangrove with exposed branches where they can get a good view of any intruders. 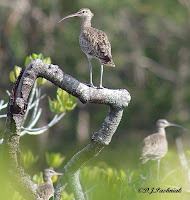 I then paddled up the creek to where I have sometimes found Whimbrels. These birds also roost in mangroves but they roost in the higher more leafy branches and are very hard to see. There are always one or two birds on an exposed top branch which seem to act as look-outs for the ones that are lower down. If you get too close the whole flock will fly noisily out of the mangroves. The birds this morning were not settled and portions of the roosting flock kept flying up and then resettling. I estimated about 40 birds but there could have been considerably more that I could not see. For more great bird photos visit the Bird Photography Weekly. After posting last week about Pied Oystercatchers, I decided to hunt up my photos of Sooty Oystercatchers. I have never seen this species around the bay as it prefers rocky shorelines and headlands. Apart from colouring these birds look very similar to Pied Oystercatchers. 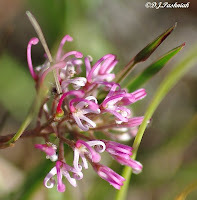 I took these photos at Point Cartwright on the Sunshine Coast. 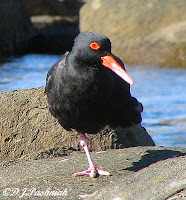 I saw two Sooty Oystercatchers that day roosting among the rocks with a group of Crested Terns. Sooty Oystercatcher with Crested Tern in non-breeding plumage. Snapper Creek just upstream from where the dolphins visit. See the previous post about these dolphins. Visit SWF for more great sky photos. Preamble: It has taken me a long time to get around to posting about Tin Can Bay's major natural tourist attraction. I send all my visitors around to see this but seldom go by myself. However, this was one thing that convinced me that this would be a great place to live – water clean and quiet enough for these beautiful creatures would definitely be clean enough for me! 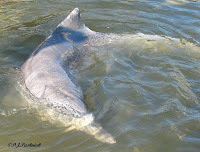 Some years ago an Indo-pacific Humpback Dolphin was injured in the Tin Can Bay area. 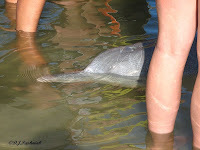 The fishermen down at Snapper Creek fed the dolphin until it recovered and was able to completely look after itself again. However, a pattern was set and the dolphin returned on most mornings for a free feed. This is the basic story that all agree on, but since records were not kept the details vary slightly. 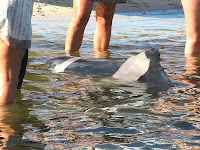 I was originally told that the injured dolphin was a female – Scarry - and she brought her next calf with her. Scarry had disappeared some weeks before I came to this area but her calf – now a full-grown male named Mistique - continued to come in for his free feed. In the past 5 years Mistique has become the dominant male in his group and now brings in a female, Patch, and another young male, Harmony. Ever since I have been here the dolphin feeding and viewing has been carefully managed and monitored. About a year ago the Queensland government stepped in and approved a new management plan. The dolphins are fed at the same time each morning. They may come a little earlier – or not at all some mornings. They only get 3 kgs of fish which is a mere snack compared with their total intake each day. There is a dedicated band of volunteers who organize and manage all visitors. The rules are strict! Wash your hands before coming into the water. Do not touch the dolphins at all. If they touch you that is OK. The result is a great experience of wild dolphins who eagerly come in for a few fish and then quickly disappear for the rest of the day. Mistique and Harmony approaching the waiting visitors. This morning was perfect weather for kayaking. We've had so many weeks of positively miserable weather that this was a very welcome change. My friend Sarah had visitors from Ireland and we decided to go to the south side of Crab Creek. This would not be too distant for a couple of people who had done very little kayaking before, but it was almost certain that we would see a good number and variety of shorebirds. We had great views of quite large flocks of Bar-tailed Godwits, Whimbrels, Eastern Curlew, Common Greenshank, and Grey-tailed Tattler, as well as the resident Red-capped Plover. The highlight of the morning was finding the Pied Oystercatchers again that last time were acting as if they had either a nest or young ones somewhere. This morning they were still acting very agitated but we could now see two other birds – not quite as large and still with juvenile plumage. They had already fledged and could fly although the adult birds were obviously happier to keep them in the same area of saltmarsh where they had nested. This was a great sighting as I have never before seen Pied Oystercatchers either nesting or with young around the bay. I have been living here for more than five years and have certainly looked everywhere for them. 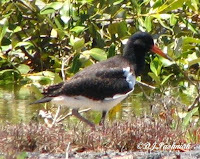 I have seen nesting Pied Oystercatchers down on the Noosa River, but have not seen young ones down there either. My birding book says that juveniles have brown/black back and wing feathers with paler edges and the bill is reddish with a dusky tip.